, an eminent English divine, and the last surviving father of the English Reformation, | descended from an ancient family of Norman origin, was the son of John Nowejl, esq, of Read, in the parish of Whailey, a,nd county of Lancaster. This gentleman, who was twice married, had, by his first wife, Dowsabel, daughter of Robert Hesketh, esq. of Rufford, in Lancashire, an only son, Roger Noweli, whose issue male, in a direct line, enjoyed the family estates for more than two centuries. By his second wife, Elizabeth, daughter of Mr. Kay of Rachdale, he had four sons, Alexander, the subject of this article, Laurence, Robert, and Nicholas; and several daughters. Alexander was born in 1507 or 1508, at Readhall, anciently Rivehead or Riverhead, a mansion on the Calder, a tributary branch of the Ribble. A view of this his birth-place, as it stood in 1750, is given in Mr. archdeacon Churton’s “Life of Alexander Noweli,” a work which has furnished the substance of this sketch. He was educated at Middleton, about six miles from Manchester; but who was his preceptor there we have not learnt. That his elementary progress was rapid, we may reasonably presume, as he was deemed ripe for the university, where, however, early entrances were then more frequent, at the age of thirteen. Respecting this number a singular coincidence is mentioned, whether it were the result of choice, or of accident. He became a member of Brasen-nose college at the age of thirteen; he resided there thirteen years and he afterwards bestowed on the society thirteen scholarships. 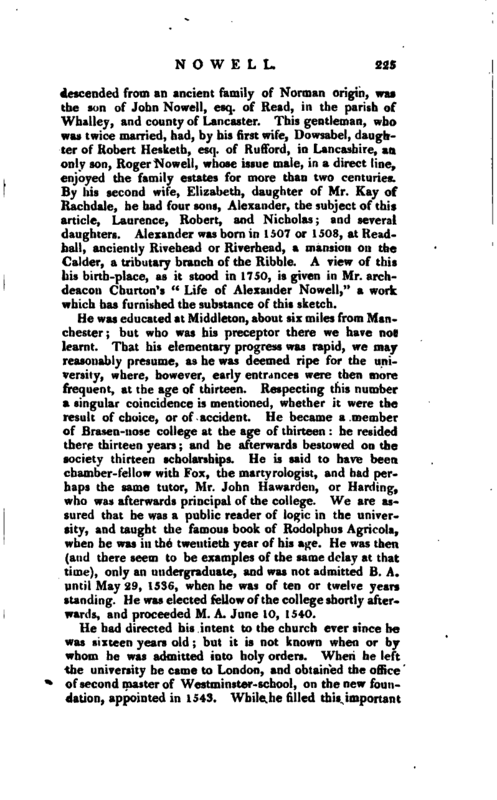 He is said to have been chamber-fellow with Fox, the martyrologist, and had perhaps the same tutor, Mr. John Hawarden, or Harding, who was afterwards principal of the college. We are assured that he was a public reader of logic in the university, and taught the famous book of Rodolphus Agricola, when he was in the twentieth year of his age. He was then (and there seem to be examples of the same delay at that time), only an undergraduate, and was not admitted B. A. until May 29, 1536, when he was of ten or twelve years standing. He was elected fellow, of the college shortly afterwar, is, and proceeded M. A. June 10, 1540. He had directed his intent to the church ever since he was sixteen years old; but it is not known when or bv whom he was admitted into holy orders. When he left the university he came to London, and obtained the office of second master of Westminster-school, on the new foundation, appointed in 1543. While he filled this important | post, he is said to have been diligent in teaching his pupils pure language and true religion: using for the former purpose Terence, and for the latter St. Luke’s Gospel and the Acts of the Apostles, in the original Greek. He appears to have been licensed as a preacher in 1550, but where he exercised his talent we are not particularly informed: except that he preached, during this reign, “in some of the notablest places and auditories df the realm.” The first production of his pen that we have met with was some lines in honour of the memory of Bucer, who died at Cambridge in 1551, which shew that he was of congenial sentiments on the subject of religion with that celebrated reformer; and the same year he held an interesting conference with Redmayne, master of Trinity college, Cambridge, then on his death-bed, respecting the principal articles which separated the English from the Romish church. In that year also he succeeded Redmayne as one of the prebendaries of Westminster. 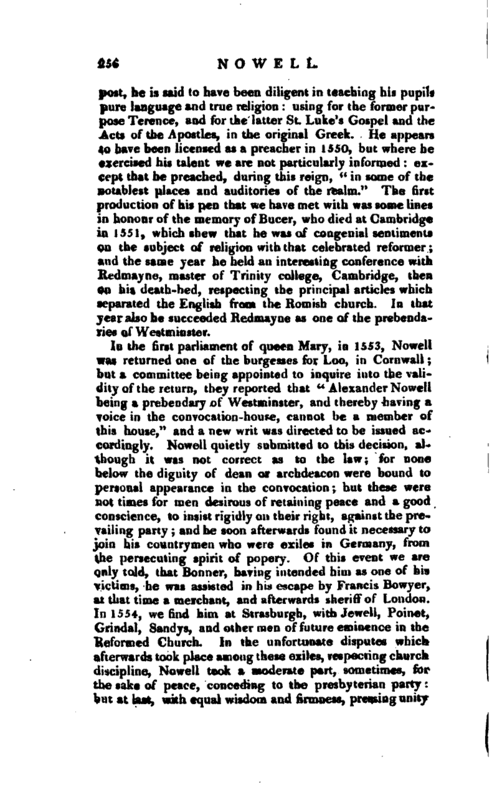 In the first parliament of queen Mary, in 1553, Nowell was returned one of the burgesses for Loo, in Cornwall; but a committee being appointed to inquire into the validity of the return, they reported that *‘ Alexander Nowell being a prebendary of Westminster, and thereby having a voice in the convocation-house, cannot be a member of this house,“and a new writ was directed to” be issued accordingly. Nowell quietly submitted to this decision, although it was not correct as to the law; for none below the dignity of dean or archdeacon were bound to personal appearance in the convocation; but these were not times for men desirous of retaining peace and a good conscience, to insist rigidly on their right, against the prevailing party; and he soon afterwards found it necessary to join his countrymen who were exiles in Germany, from the persecuting spirit of popery. Of this event we are only told, that Bonner, having intended him as one of his victims, he was assisted in his escape by Francis Bowyer, at that time a merchant, and afterwards sheriff of London. In 1554, we find him at Strasburgh, with Jewell, Poinet, Grindal, Sandys, and other men of future eminence in the Reformed Church. In the unfortunate disputes which afterwards took place among these exiles, respecting church discipline, Nowell took a moderate part, sometimes, for the sake of peace, conceding to the presbyterian party: but at last, with equal wisdom and firmness, pressing unity | in essentials, and’submission in smaller matters to authority duly appointed and legally exercised. On the accession of queen Elizabeth, Nowell returned to England, and was soon fixed upon, with Parker, Bill, Whitehead, Pilkington, Sandys, &c. to be promoted to the chief preferments then vacant. His first employment seems to have been that of one of the commissioners for visiting the various dioceses, in order to introduce such regulations as might establish the Reformation. One of these commissions, in which NowelL’s name appears, was dated July 22, 1559. In December of that year, he was appointed chaplain to Grindal, and preached the sermon on the consecration of that divine to the bishopric of London. Preferments now began to flow in upon him. On Jan. 1, 1559-60, Grindal collated him to the archdeaconry of Middlesex; in February, archbishop Parker gave him the rectory of Saltwood, with the annexed chapel of Hythe, in Kent, and a prebend of Canterbury. Saltwood he resigned within the year, as he did a prebend of St. Peter’s Westminster, then erected into a collegiate church; but was promoted to the deanery of St. Paul’s in November 1560, and about the same time was collated to the prebend of Wildland or Willand in the same church. Nowell offended the queen on another occasion, while preaching, by expressing some dislike of the sign of the cross, according to some, but, as his biographer thinks, by some allusion to the crucifix which remained for some time in the queen’s chapel. 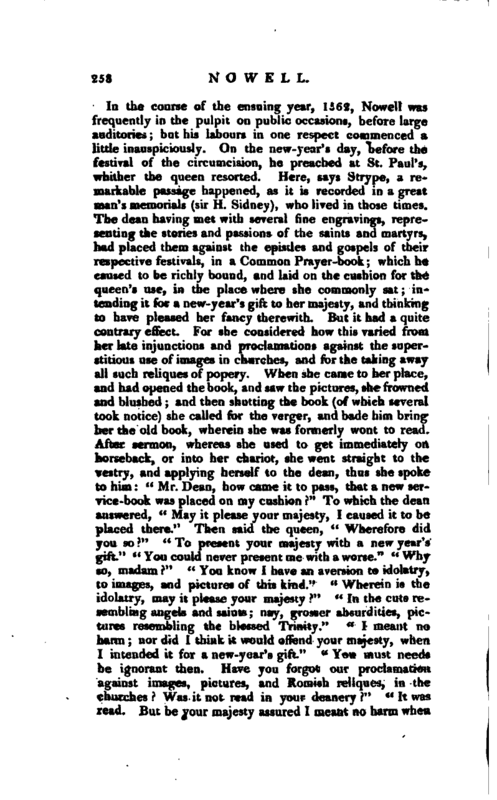 On this occasion her majesty quite confounded the poor dean, by calling aloud to him from her closet window, commanding him “to retire from that ungodly digression, and to return to his text.” Churton’s Life of Nowell, p. 110. Strype adds to this curious dialogue, that it caused all the clergy in and about London, and the churchwardens of each parish, to search their churches and chapels; and to wash out of the walls all paintings that seemed to be Romish and idolatrous; in lieu whereof, suitable texts of Holy Scripture were written. Towards the close of 1562, his patron Grindall, bishop of London, collated him to the valuable rectory of Great Hadham, in Hertfordshire, where the ample tithe-bara which he built still remains. 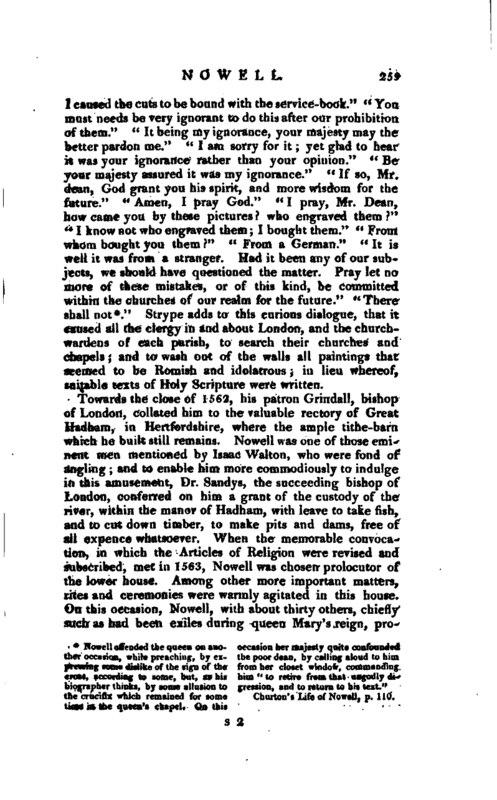 Nowell was one of those eminent men mentioned by Isaac Walton, who were fond of angling; and to enable him more commodiously to indulge in this amusement, Dr. Sandys, the succeeding bishop of London, conferred on him a grant of the custody of the river, within the manor of Hadham, with leave to take fish, and to cut down timber, to make pits and dams, free of all expence whatsoever. 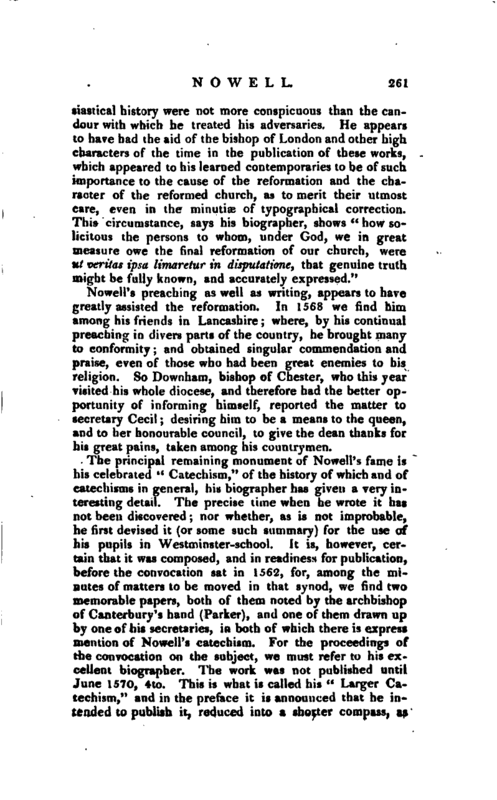 When the memorable convocation, in which the Articles of Religion were revised and subscribed, met in 1563, Nowell was chosen prolocutor of the lower house. Among other more important matters, rites and ceremonies were warmly agitated in this house. On this occasion, Nowell, with about thirty others, chiefly such as had been exiles during queeu Mary’s reign, | proposed that some other long garment should be used instead of the surplice, or that the minister should, in time of divine service, use the surplice only; that the sign of the cross should be omitted in baptism, and that kneeling at the holy communion should be left to the discretion of the ordinary; that saints’ days should be abrogated, and organs removed. But the majority would allow of no alterations in the liturgy or rules of Edward the Sixth’s service-book (knowing the wisdom, deliberation, and piety, with which it had been framed) as it was already received and enforced by the authority of parliament, in the first year of the queen. During the plague, the ravages of which this year were very extensive, he was appointed to draw up a homily suitable to the occasion, and a form of prayer for general use, both of which were set forth by the queen’s special commandment, July 10, 1563. 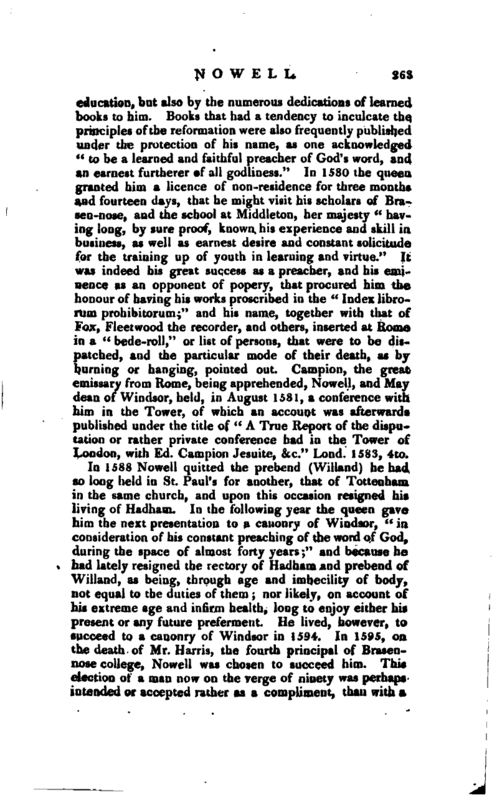 Nowell, who continued to be a very frequent, and one of the most approved of the public preachers at Paul’s Cross, introduced in one of his sermons, Harding’s answer to Jewell, reading some passages of it, and confuting them. This was no uncommon practice in those days, during the activity of the popish party, and before matters of controversy could be usefully committed to the press. In the same year he“noticed, in another of his sermons, Dorman’s answer to Jewell, and appears from this time to have employed his leisure in preparing a more formal answer to that heap of misrepresentations. It was in 1560 that Jewell made his famous challenge to the papists, that none of the peculiar and discriminating dogmas of popery could be proved, either by warrant of scripture, or by authority of the fathers or councils, during six hundred years from the birth of Christ. 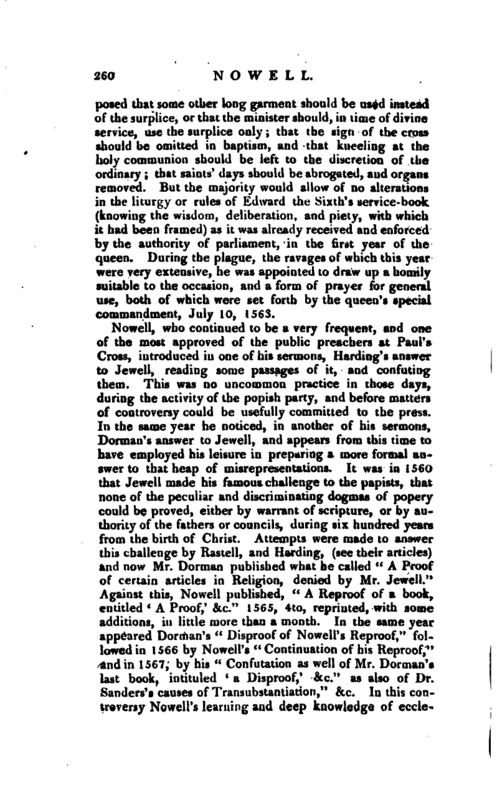 Attempts were made to answer this challenge by Rastell, and Harding, (see their articles) and now Mr. Dorman published what he called” A Proof of certain articles in Religion, denied by Mr. Jewell.“Against this, Nowell published,” A Reproof of a book, entitled “A Proof,’ &c.” 1565, 4to, reprinted, with some additions, in little more than a month. In the same year appeared Dorman’s “Disproof of Nowell’s Reproof,” followed in 1566 by Nowell’s “Continuation of his Reproof,” and in 1567, by his “Confutation as well of Mr. Dorman’s last book, intituled * a Disproof,' &c.” as also of Dr. Sanders’s causes of Transubstantiation,“&c. In this controversy Nowell’s learning and deep knowledge of | ecclesiastical history were not more conspicuous than the candour with which he treated his adversaries. 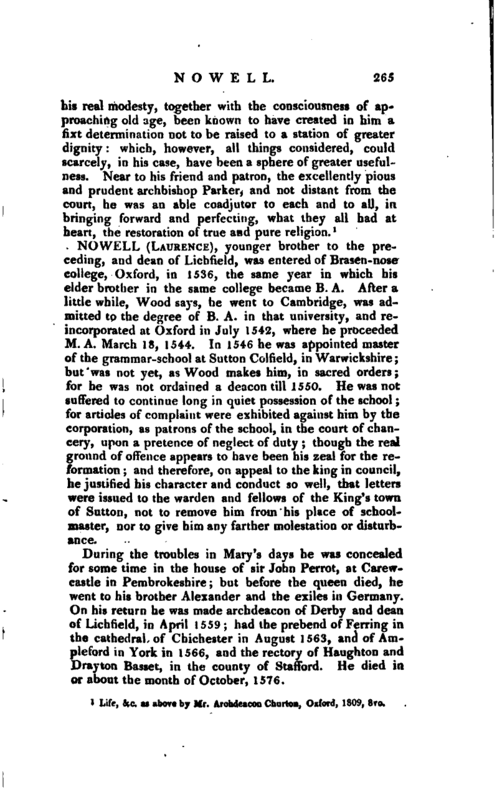 He appears to have had the aid of the bishop of London and other high characters of the time in the publication of these works, which appeared to his learned contemporaries to be of such importance to the cause of the reformation and the character of the reformed church, as to merit their utmost care, even in the minutiae of typographical correction. This circumstance, says his biographer, shows” how solicitous the persons to whom, under God, we in great measure owe the final reformation of our church, were ut writes ipsa limaretur in disputatione, that genuine truth might be fully known, and accurately expressed." NowelPs preaching as well as writing, appears to have greatly assisted the reformation. In 1568 we find him among his friends in Lancashire; where, by his continual preaching in divers parts of the country, he brought many to conformity; and obtained singular commendation and praise, even of those who had been great enemies to his religion. So Downham, bishop of Chester, who this year visited his whole diocese, and therefore had the better opportunity of informing himself, reported the matter to secretary Cecil; desiring him to be a means to the queen, and to her honourable council, to give the dean thanks for his great pains, taken among his countrymen. The principal remaining monument of Nowell’s fame is his celebrated “Catechism,” of the history of which and of catechisms in general, his biographer has given a very interesting detail. The precise time when he wrote it has not been discovered; nor whether, as is not improbable, he first devised it (or some such summary) for the use of his pupils in Westminster-school, It is, however, certain that it was composed, and in readiness for publication, before the convocation sat in 1562, for, among the minutes of matters to be moved in that synod, we find two memorable papers, both of them noted by the archbishop of Canterbury’s hand (Parker), and one of them drawn up by one of his secretaries, in both of which there is express mention of Nowell’s catechism. For the proceedings of the convocation on the subject, we must refer to his excellent biographer. The work was not published until June 1570, 4to. This is what is called his “Larger Catechism,” and in the preface it is announced that he intended to publish it, reduced into a shorter compass, as | soon as possible. The abridgment accordingly came out the same year, and both in Latin. They were soon after, for the sake of more extensive usefulness, translated into English, by Thomas Norton, of whom we have lately taken notice, and into Greek by the Dean’s nephew, Whitaker, but the Greek translation of the larger, which was first printed (along with the Latin) did not appear until 1573, and that of the smaller in 1575. 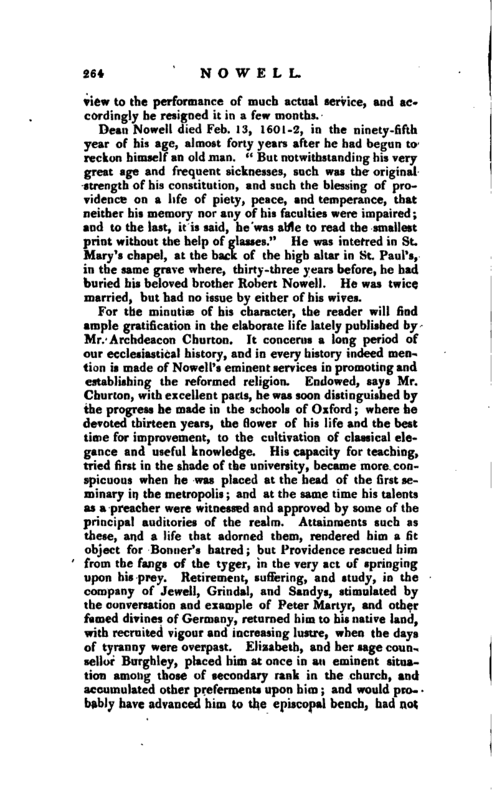 His biographer gives some account of a third Catechism, attributed to Nowell, but its history seems involved in some obscurity. 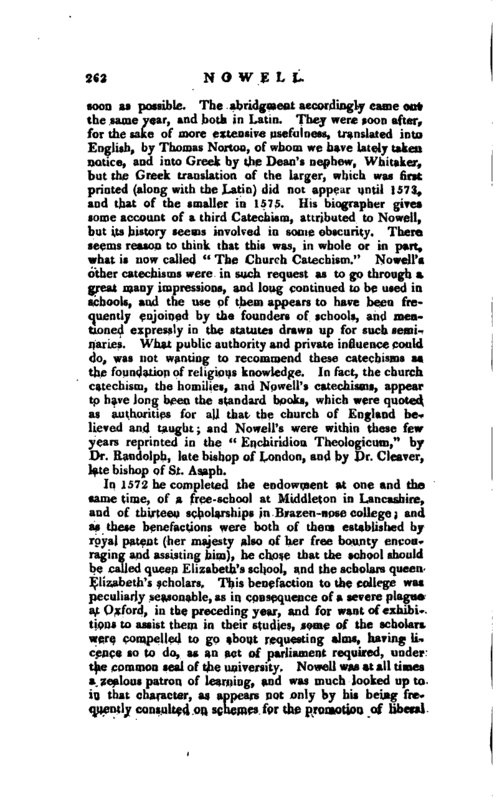 There seems reason to think that this was, in whole or in part, what is now called “The Church Catechism.” Nowell’s other catechisms were in such request as to go through a great many impressions, and long continued to be used in schools, and the use of them appears to have been frequently enjoined by the founders of schools, and mentioned expressly in the statutes drawn up for such seminaries. What public authority and private influence could do, was not wanting to recommend these catechisms as the foundation of religious knowledge. 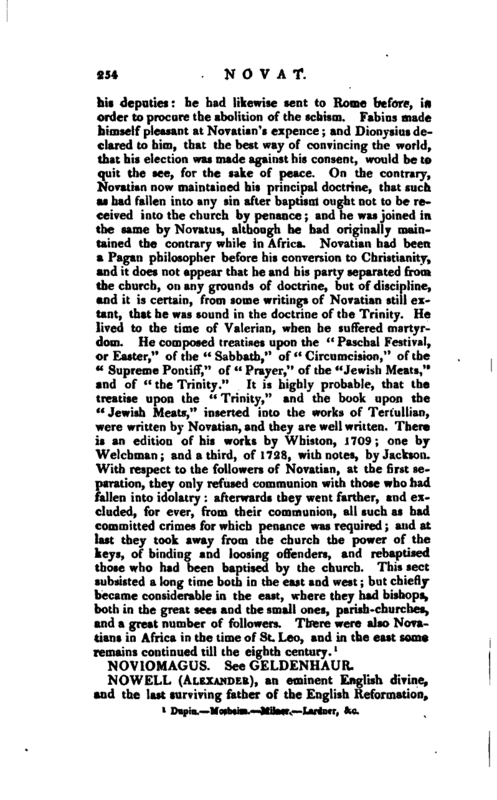 In fact, the church catechism, the homilies, and Nowell’s catechisms, appear to have long been the standard books, which were quoted as authorities for all that the church of England believed and taught; and Nowell’s were within these few years reprinted in the “Enchiridion Theologicum,” by Dr. Randolph, late bishop of London, and by Dr. Cleaver, late bishop of St. Asaph. In 1572 he completed the endowment at one and the same time, of a free- school at Middleton in Lancashire, and of thirteen scholarships in Brazen-nose college and as these benefactions were both of them established by royal patent (her majesty also of her free bounty encouraging and assisting him), he chose that the school should be called queen Elizabeth’s school, and the scholars queen Elizabeth’s scholars. This benefaction to the college was peculiarly seasonable, as in consequence of a severe plague at Oxford, in the preceding year, and for want of exhibitions to assist them in their studies, some of the scholars were compelled to go about requesting alms, having licence so to do, as an act of parliament required, under the common seal of the university. 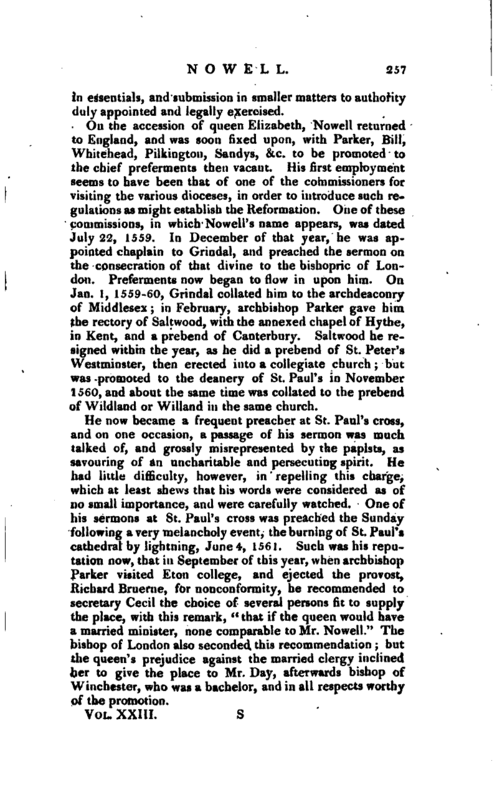 Nowell was at all times a zealous patron of learning, and was much looked up to in that character, as appears not only by his being frequently consulted on schemes for the promotion of liberal | education, but also by the numerous dedications of learned books to him. Books that had a tendency to inculcate the principles of the reformation were also frequently published under the protection of his name, as one acknowledged “to be a learned and faithful preacher of God’s word, and an earnest furtherer of all godliness.” In 1580 the queen granted him a licence of non-residence for three months and fourteen days, that he might visit his scholars of Brasen-nose, and the school at Middleton, her majesty “having long, by sure proof, known his experience and skill in business, as well as earnest desire and constant solicitude for the training up of youth in learning and virtue.” It was indeed his great success as a preacher, and his eminence as an opponent of popery, that procured him the honour of having his works proscribed in the “Index librorum prohibitorum;” and his name, together with that of Fox, Fleetwood the recorder, and others; inserted at Rome in a “bede-roll,” or list of persons, that were to be dispatched, and the particular mode of their death, as by burning or hanging, pointed out. Campion, the great emissary from Rome, being apprehended, Nowell, and May dean of Windsor, held, in August 1581, a conference with him in the Tower, of which an account was afterwards published under the title of “A True Report of the disputation or rather private conference had in the Tower of London, with Ed. Campion Jesuite, &c.” Lond. 1583, 4 to. In 1588 Nowell quitted the prebend (Willand) he had so long held in St. Paul’s for another, that of Tottenham in the same church, and upon this occasion resigned his living of Hadham. In the following year the queen gave him the next presentation to a canonry of Windsor, “in consideration of his constant preaching of the word of God, during the space of almost forty years;” and because he had lately resigned the rectory of Hadham and prebend of Willand, as being, through age and imbecility of body, not equal to the duties of them; nor likely, on account of his extreme age and infirm health, long to enjoy either his present or any future preferment. He lived, however, to succeed to a canonry of Windsor in 1594. In 1595, on the death of Mr. Harris, the fourth principal of Brasennose college, Nowell was chosen to succeed him. This election of a man now on the verge of ninety was perhaps intended or accepted rather as a compliment, than with a | view to the performance of much actual service, and ac-r cordingly he resigned it in a few months. Life, &c. as above by Mr. Archdeacon Churton, Oxford, 1809, 8vo.